Our jolly Pu-tai stands to attention, waiting to bestow contentment and abundance onto all he sees. His rotund belly is exposed, waiting for you to rub it while he holds a Ru Yi (Chinese Sceptre), representing good fortune, in one hand and beads in the other. 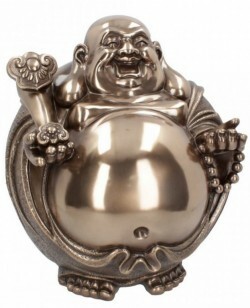 Attract wealth with this happy Buddha. Excellent display piece for the home.